The Victorians were led by the ACT crew for the first 1200 metres of the race. 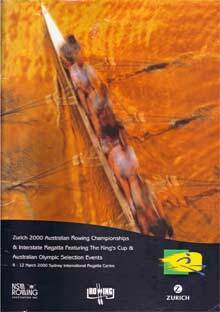 The Victorians then lifted their rate and work to get through the ACT crew and then extend the lead over the last 500 metres. It was a fast and furious race with a very high rating in the Victorian crew over the last 800 metres. The defending champions WA were unfortunately last. The Tasmanians were too strong for the rest of the field and won comfortably. 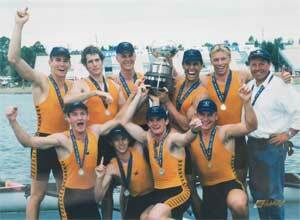 The WA crew were pushed by the Victorians who were 0.21 seconds behind at the finish. The win to Victoria enabled Georgina Douglas to pick her second win for the Championships with her success in the single for the Nell Slater trophy. She also had the thrill of watching her brother win the men's eight championship for the King's Cup. Douglas started well and went on to win comfortably from Hatzakis in a strong performance. This was South Australia's first win in this event and as it turned out, the first of many. This race had a stirring finish with very little separating the Victorian and NSW crews.